Just when you think you’ve got your little one’s sleeping pattern under control, along comes the toddler years! For many parents, they dream of regaining those essential 8 hours of sleep once the baby stage is over. However, the transition from crib to toddler bed isn’t as easy and as peaceful as you’d expect. It can be difficult for toddlers to adjust to sleeping in their own bed, leading to tantrums, restless nights and hours spent trying to coax them from your bed to theirs. 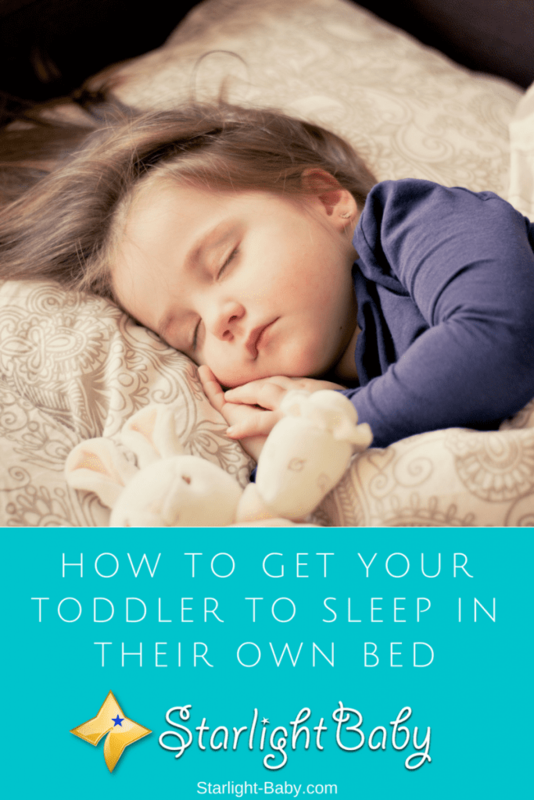 If you’re struggling to get your toddler to sleep in their own bed and you’re just about ready to lose your sanity completely, below you’ll find some great tips that can help. It’s easy to assume your toddler is just being difficult and trying to assert control over the situation, but there might actually be a deeper reason why they refuse to sleep in their own beds. Often, it’s not just the bed they don’t want anything to do with – it’s their entire room. So why do they see sleeping in their own bed as a bad thing? Well, largely it tends to be down to fear. It can be terrifying to a toddler to sleep in an open bed for the first time. Even if they seemed to sleep fine in their own bed for a while, they can still develop fears which cause them to go backwards and insist on sleeping in your room. It could be they are scared of the dark, or that monsters are in their room. So, try to establish whether fear is the reason behind your little one’s reluctance to sleep alone. Then, you can take steps to ease their mind. For example, if they are scared of the dark you could use a night light, or leave their door open a little with the hallway light left on. If they’re scared about monsters lurking in their room, you can talk to them and reassure them that monsters aren’t real. You could even get creative and say monsters can’t get them anyway as their bed has a protective shield around it and as long as they stay in there, they’ll be safe. You’ll be surprised what creative stories parents come up with to help ease their toddler’s fears! A more unusual, yet surprisingly effective way to get your toddler used to their own bed is to set up a tent in your room. This is particularly ideal for parents currently having to share their bed every night with their restless toddler. Setting up a small child-size tent in your room will get your toddler out of your bed, but still provide the comfort that you aren’t far away. They’ll get used to sleeping on their own, making it easier to gradually get them to sleep in their own room, then in their bed. If your toddler tends to get more attention at night than they do during the day, they won’t want to give that up. After all, every child wants love, attention and lots of cuddles! So, if you think the problem might be they crave the attention, try to do more with them in the day. If they feel like they are getting plenty of attention throughout the day, they’ll be less likely to make a fuss at being alone during the night. So, arrange more one-on-one playtime and give them plenty of cuddles and praise during the day. Getting your toddler to sleep in their own bed isn’t going to be straightforward. Even all the tips here aren’t going to alter the fact that it’s going to be tough. There’s going to be a lot of crying, from both of you, along with a good amount of tantrums for good measure. When you’re sleep deprived and groggy during the night, it’s so easy to give in and allow your little one to climb back into bed with you. However, if you do this you will literally undo all of the hard work you’ve done to get this far. So, you’re going to need to be patient, have bundles of willpower and understand that it’s not going to happen overnight. One of the most common struggles parents have when trying to set a strict bedtime routine, is when their toddler falls sick. You’re not a monster, you love your little one and leaving them alone when they’re sick isn’t something you want, or have to do. However, rather than letting them stay in your bed, consider staying with them in theirs. If you can’t fit in their bed, set up a blow-up mattress or anything you can sleep on in their room. That way, you won’t be disrupting their sleep routine, or setting yourself up for problems when they aren’t sick anymore. It can really help to make your toddler’s room cozier and more child-friendly. You could even let them help you decorate the room. If they get involved with the design, they’ll actually want to sleep in there. Give them lots of comforting things too, such as blankets, teddies and cushions. Another great tip is to choose a novelty bed. You can buy all kinds of weird and wonderful toddler bed designs which make sleeping in them a lot more fun. You might even be able to find a bed that’s designed with your toddler’s favorite cartoon or movie characters in mind. For older toddlers, a reward system is often very effective. For each night they stay in their own bed, they can receive either points or stars. These can be added to a chart so your toddler can see how well they are doing. Once they receive a certain number of points or stars, they can trade them in for rewards. There’s a few ways of doing this. You could give them a reward for every 2-3 stars they receive, or you can give them a choice to earn bigger rewards for staying in their own bed for longer periods. With the latter method, you could increase the reward size for extended periods of time where they stay in their own bed. So, for 7 stars, they could earn a new small toy, but if they choose the extend the time period, for 12 or 14 stars they could earn a bigger reward. Overall, all of the tips and advice in the world isn’t going to the transition completely stress-free. There’s going to be days your toddler screams, cries and has a total meltdown about sleeping in their own bed. However, the tips above will definitely make it easier and speed up the transition. Do you have your own tips that helped you get your toddler to sleep in their own bed? Do us all a favor and share them below! Right on time. We are currently still in the process of getting our boy to fully sleep in his own bed. We made him his own room before he was born and we made sure that it’s nicely designed and has everything he could possibly want/need. He uses the room often during the day to play but then comes the night. Maybe we have spoiled him too much by just letting him always sleep in between us but it is taking quite a lot of effort for us to transition him into his own bed. Right now, we manage some nights and some nights he ends up coming back to our bed and since we’re tired we end up letting him – bad, I know. The bad side of him constantly sleeping with us is definitely lack of privacy and intimacy between my partner and me. What we have found the best so far is that reward system you briefly described above. The trick is to find out what he likes the most. Maybe toys or more television time and so on and make a chart. Every time he sleeps in his own bed you mark it on the chart and XY amount of charts bring him to a certain reward. Sort of like a reward system based on what he likes. We just have to get more persistent and get him back to his own bed when he does come crawling in between us. It can just hard because you want the best for them and cuddle them up all day. The joy of having a baby is something the pain of nurturing is another. After a warm and delightful recreption into the world, parents must work hard, orchestrate and diligently apply care in regaining their private and marital relationship. A child’s refusal to sleep in his bed/room may be worrisome especially for those without experience. The various tips discussed are really handy if properly utilised. I will however like to a point simple and potent. Make them your friend, let them sleep in your arms, lay them over your chest, transfer them to their bed only when they are fast asleep. Check on them before they are awake for more assurance. Remember they wanted to be with you because they love you. Do not reciprocate with hatred. Give love and it shall turn out to be lovely transition. We are still co-sleeping with all our kids, even the eldest is already 8 years old. I am fine with co-sleeping with them, we just moved in more beds into our bedroom to fit everyone in. I’ll just wait until they are ready to move to their bedrooms on their own. I think kids will feel more comfortable and secured being together with the parents, and hence they always choose to sleep with the parents, especially moms. We enjoy the time when we turn off the light and lying down on the beds. It’s a good connection time that we share and chat. By the way, I like the idea of putting a tent in the bedroom. My kids always do that in the room, though it’s not an idea to move them to their own room. Our four months old baby sleeps next to my wife. Ever since my wife knew about kangaroo mother care, she does not let the baby sleep on his cot. Kangaroo mother care is a way to make your baby sleep on your naked chest so that he gets the required warmth. This improves blood circulation and regulates heartbeat. In our culture, parents sleep with the babies until he/she is at least 8 years old. However, soon a time will come when we have to make the baby sleep on different beds for the safety of the baby. When the time comes, we will have to follow these tips. Thank you very much. Toddlers are so attached to their when it comes to sleeping. I have seen some that can’t really sleep all alone by themselves without the parent being in the same bed with them. I think that cultivating the habit of them sleeping alone in their own bed early is the best way to start with this. At this time, they would virtually do anything you tell them. You can feed them lies to make them feel comfortable with sleeping alone. Overall, all the tips listed here are going to be effective in getting the toddlers to have a nice nap in their own bed being very comfortable. A couple of days ago, we celebrated our baby’s first birthday. The baby can walk with a support, he is able to understand verbal communication, he can speak a few words. The baby is now officially in the toddler stage. Until now the baby sleeps beside my wife. We never let the baby sleep in the crib. Sleeping with the baby at your side is a culturally recommended practice here. A child as old as 10 years sleeping at the side of his mother is very common here. I don’t think I will be thinking about letting the child sleep in another room until he is at least 5 years old.